This chapter proposes for cultivating peace values and developing peace consciousness for creating global nonviolent sustainable society in 21st century. Our World is divided and conflict-torn, socially and ecologically unsustainable. At present we are living in a violent consciousness because modern civilization is based on culture of conflicts and violence due to erosion of human values. It focuses on the global recognition of Peace as a matter of common concern to save the humanity through Peace Education. The chapter explains the human conflicts and root causes of violence, different types of violence in the society, culture of violence and Violent Social Order. Meaning of Peace - What is Peace Education? 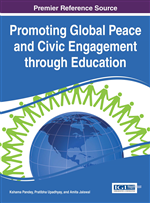 What is the need for Peace Education in 21st Century and Goals for Peace Education? Culture of Peace and Universal Peace values? The chapter concludes with a strategy of Peace Education for Living and Learning Together: Towards 21st Century” for creating global nonviolent sustainable society in 21st Century. The world has witnessed dramatic changes in the 20th Century. Humanity is facing a terrible challenge of its own existence. At the turn of the 21st Century, the world was immediately gripped by the conflicts, violence and war on Terrorism. In reflection, the 20th Century was a period marked by tremendous technological and economic progress — but it was also the most violent century in human history. As we know that the world has been transformed into a global village. Globalization is having a major impact not only on the business world but also on the whole humanity. Global recession, Global warming, climate change, poverty, conflict and violence are the main challenges that have dominated the first decade of the 21st century. We are now living in a violent social order that prevails in the social tension, conflicts, wars and division of humanity due to the racism, fundamentalism, Casteism, sexism religion and ethnic challenges. Conflict is an expressed struggle between at least two interdependent parties who perceive incompatible goals, scare resources, and interference from others in achieving their goals. Conflict is a part of life, and its man’s nature, which is neither good nor bad, comes in the mind of man due to hatered or greed. Conflict is not the same as violence, conflict is inevitable in human nature but violence is not. Fear of violence can be as damaging as violence itself. Violence is embedded in our society/. Conflicts arise when people are competing for the same resources (such as territory, jobs and income, housing) when they aren't fairly distributed or when there aren't enough to go round. Conflicts arise when the people are unhappy with how they are governed. The most common conflicts occur when a particular group wants to be independent from a central government, or when their viewpoint isn't represented in the government, or when the government oppresses them and doesn't respect or meet their basic needs. Conflicts arise when people's beliefs clash. Religious and political views are particularly sensitive, because people often depend on these for a sense of identity and belonging.